Midyim is native to Australia. 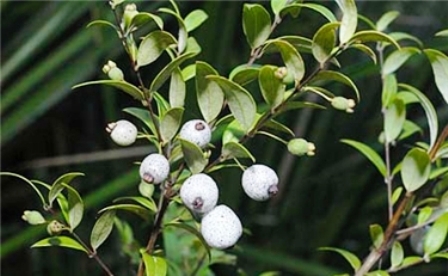 It is a small rambling shrub with pointed leaves, upto 2.5 cm long. This plant usually grows in sandy soils. A a spreading shrub up to 2 m tall. Leaves are glossy dark green lanceolate 9-30 mm long by 3-10 mm wide with numerous conspicuous oil glands. They are arranged in opposite rows. The undersurface of the leaves has a dense covering of appressed hairs giving it a pale appearance. The young coppery coloured growing shoots are densely silky hairy. The flowers are 7-1 0 mm in diameter and have white ovate petals. They are usually borne in clusters of 2-5 flowers in the upper axils, although solitary flowers are also common. The fruits are berries containing 3-9 pale brown seeds. 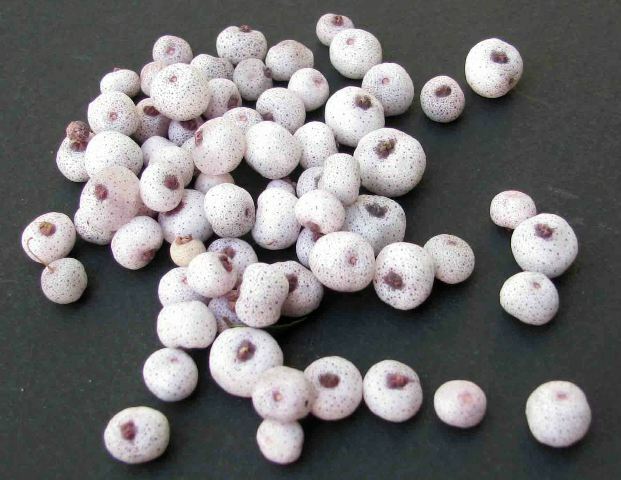 They are white and covered in small blue black spots, giving the fruit a mauvish appearance. The fruit are edible and have a sweet taste. The fruits ripen in autumn. The fruits are gathered and eaten fresh by aborigines. They have a pleasant aromatic taste. Bush fruit fans relish midyim fruits very much. Midyim is a relatively easy species to propagate. Fresh cleaned seed germinates in 3-4 weeks while uncleaned fruits take about a week longer. Although the testa (the outer coat) of the seed is hard no mechanical scarification is necessary. Propagation from cuttings is also easy. The species has been performing well in cultivation at the Australian National Botanic Gardens as a low shrub on the margins of the rainforest gully. In full sun it forms a dense spreading shrub up to 40 cm high by 1.4 m in diameter, while in more shaded areas it becomes a more open ground cover. 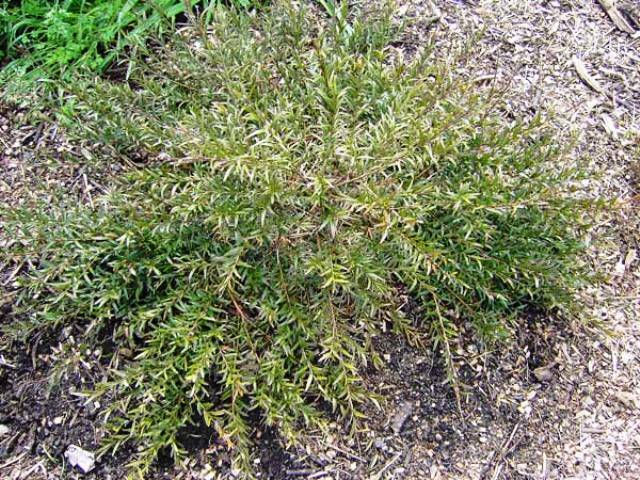 It forms an excellent shrub in sandy coastal situations where not directly exposed to salt winds. Other requirements for cultivation are an assured moisture level and some overhead tree shelter in areas of severe frosts. Little maintenance is required and pruning is only necessary to achieve a particular shape such as. a low hedge. 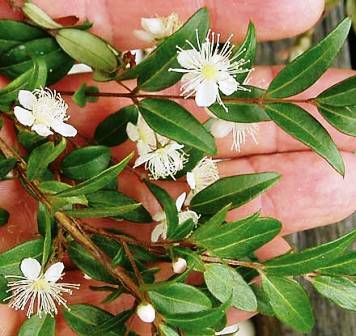 The plant appears relatively free from pests and diseases.